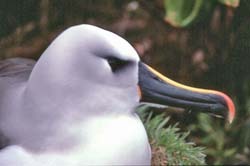 Several species of albatross breed in the Tristan da Cunha Islands, some of which are endemic to the group. The following three species of albatross breed on the Tristan islands, although a number of other non-breeding albatross species also visit. 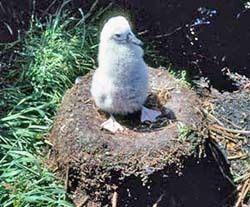 This sub-species of one of the smallest albatross only breeds in the Tristan da Cunha Islands, where is it the most common of the three breeding albatross species. Mollies return to their nesting sites in August. They build pedestal nests over 20 cm high from peat and vegetation. A single white egg is laid in September. Tristan is the principal breeding site of the species, with estimates of 16-30,000 birds. There are thought to be 5-10,000 on Gough, 1100 on Inaccessible and 4500 on Nightingale Island. Apart from Gough, this data is now out-dated. Chicks hatch in January. 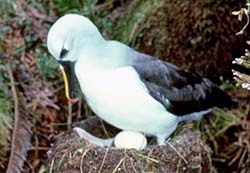 This photograph taken on Nightingale Island shows adults displaying as the chick starts to break out of the egg shell. 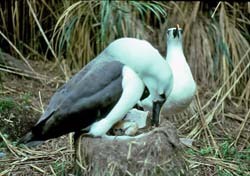 The Wildlife and Conservation Home Page shows a photograph of an adult protecting its young chick. By February both adults are busy scouring the ocean for squid and fish, leaving the downy chick vulnerable to attacks from skuas. By March chicks are growing fast, and by April they shed their downy feathers and are abandoned by their parents to enable the young adult to lose weight, try out its wings and take the plunge off the edge of The Base to seek food. Young adults don't have the characteristic yellow nose. After five years roaming the oceans they return often to their original nest site area. Atlantic Yellow Nosed Albatross are threatened by long-line fishing, and studies have estimated over 800 fatalities annually. 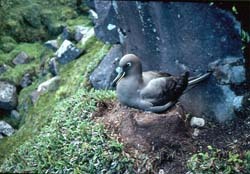 The Sooty Albatross is larger than the Molly and prefers nest sites on cliff ledges. It breeds on all four main islands, arriving in September, laying a single egg in October, hatching in December and fledglings departing in May. It is a biennial breeder (every other year) and feeds on squid, fish, prions, shearwaters and even Rockhopper Penguins! These biennial breeders return to their open mountain plateau nesting sites in November of Year 1, with eggs laid from January, chicks hatching in March, with parents protecting vulnerable young through the winter until they fledge in November / December in Year 2. One of the Great Albatrosses, the Tristan Albatross is the third rarest Albatross species, restricted to breeding on Gough ( c 1500 pairs ) and Inaccessible ( c 2-3 pairs ) Islands in the Tristan da Cunha Islands. The Albatrosses are surface feeders, catching squid and fish. This 2004 photograph from James Glass shows a juvenile on Hillpiece, Tristan da Cunha, the first recorded landing for over a century. The Tristan Albatross' main habitat was originally the high plateau on Tristan da Cunha, where it was hunted for food by Islanders in the 19th Century. This Augustus Earle 1924 watercolour shows an early hunter about to club a Gony on the high base and is reproduced with the kind permission from The National Library of Australia. An aim of conservationists is to see the majestic Tristan Albatross return to breed on its home island, hopefully heralded by the extermination of rats and mice.